A deliciously rich instant noodle dish with wheat noodles, coconut, chicken, chilli and coriander; inspired by the warm coconut Laksa dishes of Malaysia. 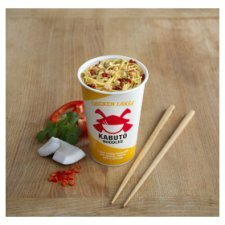 Kabuto Noodles are a delicious combination of authentic Asian flavours and quality natural ingredients, prepared with the skill, dedication and discipline of a Samurai warrior. All of our instant noodles are naturally low calorie, low fat and contain no additives, no preservatives or flavour enhancers. Our Asian inspired recipes are handcrafted by our Samurai Master, Crispin in his family kitchen and each pot is brimming with real and natural ingredients. Are you hungry and busy, but not willing to compromise on great tasting food? Say sayonara to sandwiches, and light up your lunch with Kabuto Noodles. We believe that quick and convenient meals don't have to be flavourless, so we've created restaurant flavours that are ready to eat in only 4 minutes. As we like to say, “Fortune Flavours the Brave”. Have you tried our other flavours? Why not try… Vegetable Laksa. It's completely vegetarian, bursting with real vegetables and full of flavour. Fancy a chat? We'd love to hear if you have any feedback or if there's something not quite right about your noodles. 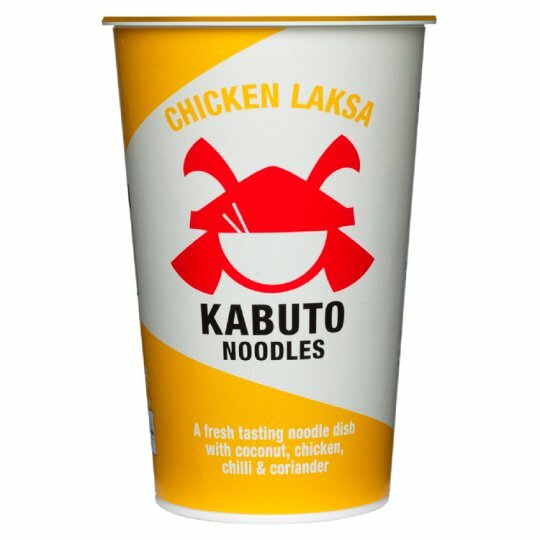 For more information visit kabutonoodles.com. Kabuto Noodles are delicious Asian inspired instant noodles made with real and natural ingredients. Absolutely nothing artificial, no additives, no preservatives and no flavour enhancers. A quick, filling and tasty meal, ready to eat in just 4 minutes. Just add boiling water and stir. And no washing up. Store in a cool dry place., Best Before End: See Bottom of Pot. Step 1) Remove lid and fill to fill line inside the pot with boiling water, replace lid loosely and wait 3-4 minutes (opportunity to meditate or practise your karate). Step 2) Stir well, leave for 1 minute, then enjoy noodles and soup straight from the pot or poured into a bowl (if no bowl available, try upside down helmet). Remember to stir well Samurai, for true goodness lies beneath. Beware Samurai, for your noodles will be hot. Make sure you eat them before they get cold and do not reheat. Failure to follow instructions will bring great shame to yourself and your family.